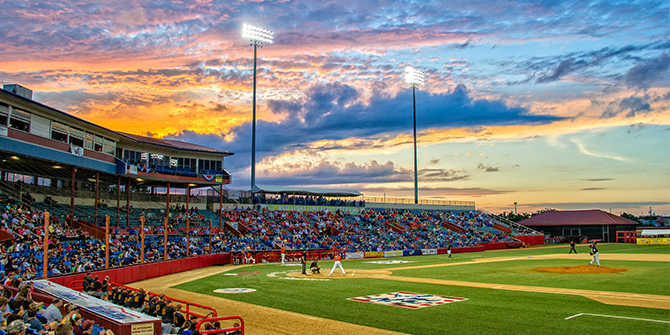 Who: This is the 11th summer for the Wingnuts, an independent baseball team that competes against teams like the Kansas City T-Bones and Texas AirHogs. As an independent team, the Wingnuts are not affiliated with an MLB team. The locally owned team is competing for its ninth division title. The Wingnuts won the American Association Championship in 2014 and last year played in their fifth league championship series. What: A fun, affordable alternative to Major League Baseball games with a focus on giveaways, special appearances, entertainment, theme nights and daily promotions. Tickets: Individual tickets range from $6-$15; group outings and party packages are also available. There are lots of fun promotional nights with ticket deals or giveaways. See the promotional schedule at wichitawingnuts.com/promotions. Don’t miss: Walk through the stadium’s concourse and the areas beyond outfield for signage sharing the history of baseball in Wichita. You’ll be surprised at how many names you’ll recognize among those who played at Lawrence-Dumont through the decades. Who: A field of 30 teams of mostly college-age and amateur players from across the country. What: Locals refer to this as “the NBC” and the teams are competing for a national championship. Championship week begins Aug. 3 following a week of pool play. When: July 27-Aug. 11, game times are 1, 4, 7 and 10 p.m.
Tickets: Individual tickets are $10 in advance and $12 day-of and are good for the full lineup of that day’s games. There are also Season passes ($100-$125) and flex packs of 20 tickets that can be used all at once for a group outing or any amount per day. Visit the NBC website to buy tickets online or call 316-977-9400 to purchase flex tickets, season passes and group tickets. Don’t miss: Watch social media for daily promotions as well as awesome fan experiences, like the new party pavilion in first base foul territory, next to the grandstand. Getting autographs and interacting with players is a big part of the NBC experience. More than 800 NBC World Series players have gone on to play Major League Baseball. That’s an average of 10 players each summer who come through Lawrence-Dumont Stadium and eventually play on baseball’s biggest stage.